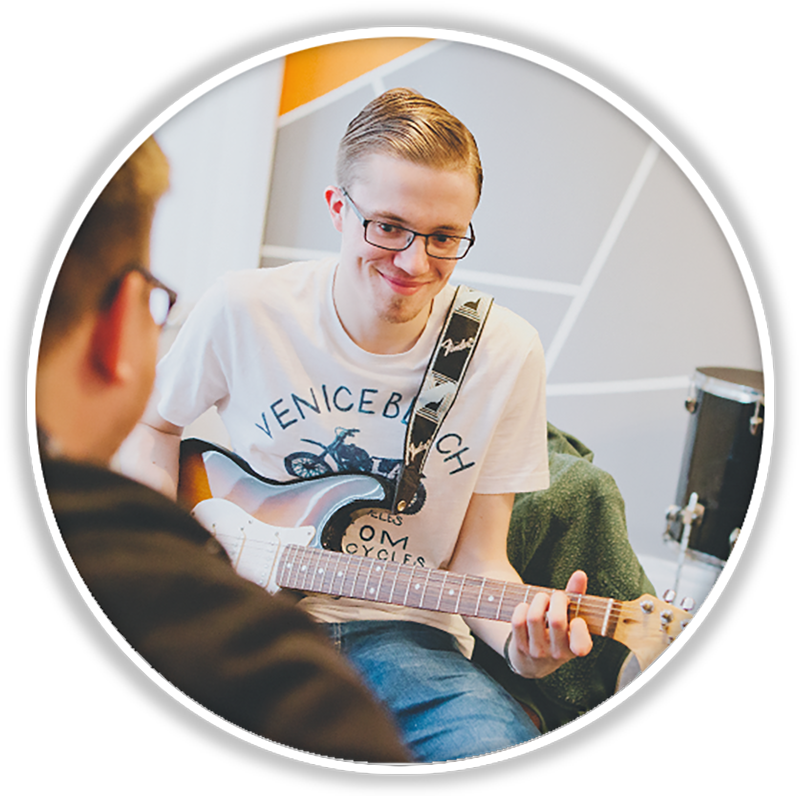 Our one-to-one guitar lessons are suitable for people of all ages and abilities. Whether you’re a complete beginner, a music lover who’s dreamt of playing, or an experienced guitarist wanting to push it to the next level, our tutors can help. PMA’s supportive and skilled team of tutors create a positive and unintimidating environment . They have expertise in a range of styles, structuring lessons to each individual student’s interests, whether that’s working towards music grades or just learning the music you like. Lessons take place weekly at our fully-equipped teaching facilities with the choice of 30, 45 and 60 minute sessions, and with a half price trial lesson for new students. So come and meet your teacher and see what we’re all about. 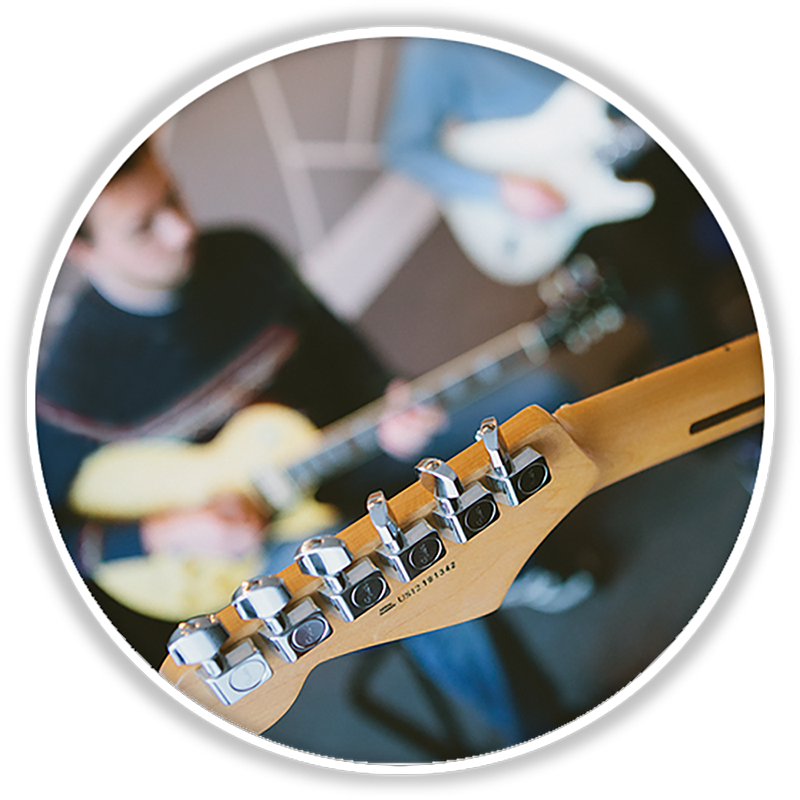 Our group guitar classes run for 12 weeks with courses starting throughout the year. The classes are aimed at beginners and led by one of our team of professional tutors. You will learn in a fun and supportive environment, and focus on developing practical skills to help you start making the most of your instrument. With group sizes averaging between 6 and 10, the course sessions take place at our fully-equipped teaching facilities in Cosham or Southsea. Each group session is an hour long and the 12 week course also includes two 30 minute one-to-one sessions that normally take place on weeks 6 and 12. We run group lessons for a range of ages and the course material is adapted to be appropriate for each age range. Our beginners guitar courses are designed for those who are completely new to playing the guitar or have tried learning in the past but want to go back to the basics. This course will start from zero. If you’re unsure whether it will be suitable for you, give us a call to talk about it. Payment must be made in full in advance to secure your place on the course. What style of guitar playing is covered? This course starts from scratch so it doesn’t really matter whether you are learning on electric or acoustic, or what style you eventually want to play, as the very basic elements of guitar playing technique will overlap. If you want to play classical guitar or bass guitar, however, this particular course is probably not suitable but contact us to ask about one-to-one lessons in these instruments. To take this course you will need a guitar for the sessions and to practise on at home. If you’re not ready to commit to buying your own guitar just yet, you can hire one from us for the duration of the course. Contact us for more information. After completing a beginners course, you can enrol on an improvers course – often the whole group continues together onto the next course. Many people also choose to take one-to-one lessons after completing a beginners group course.